Some years ago I visited Frank Lloyd Wright’s buildings in Oak Park, Chicago, including the house he designed for himself and completed in 1889. 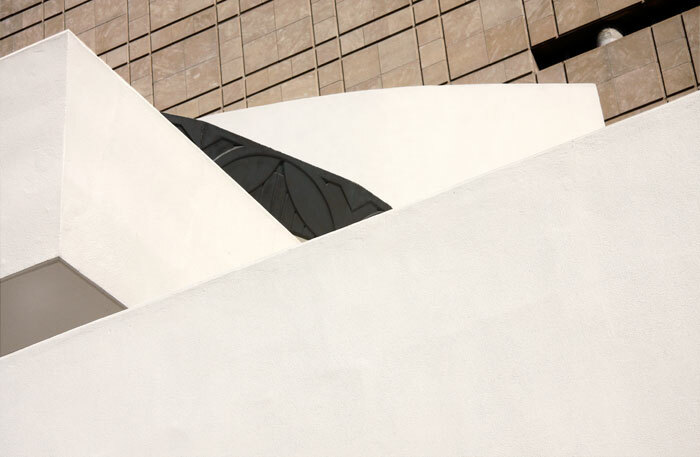 I had long appreciated his approach to architecture and its integrated design across structure, flooring, stained glass, furniture, and lighting. 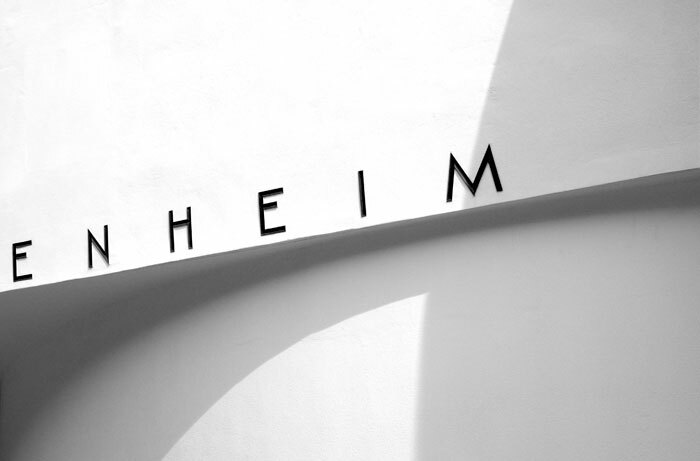 A visit to the Guggenheim Museum in 2009 was the first opportunity to photograph one of his designs in detail. People thronged the Fifth Avenue entrance area to the Museum whilst street vendors operated a row of stalls along the sidewalk backed by cars at the kerb. From across Fifth Avenue, the foliage of mature trees cut into many views of the whole building. 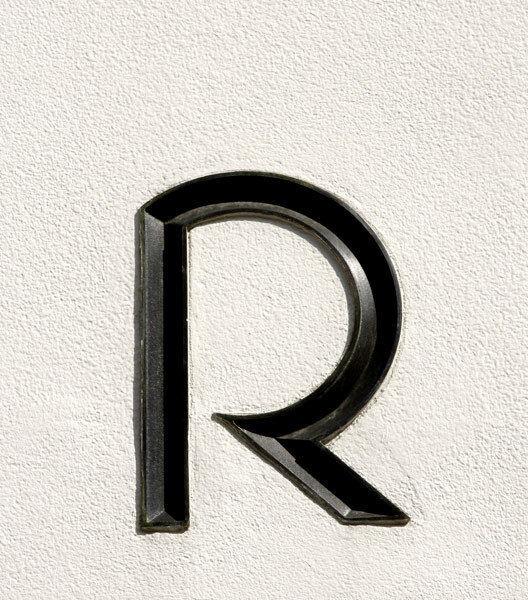 I concentrated on tightly framed images of form, surface, cast shadows, and the façade lettering with minimal reference to adjacent buildings and the complete structure. 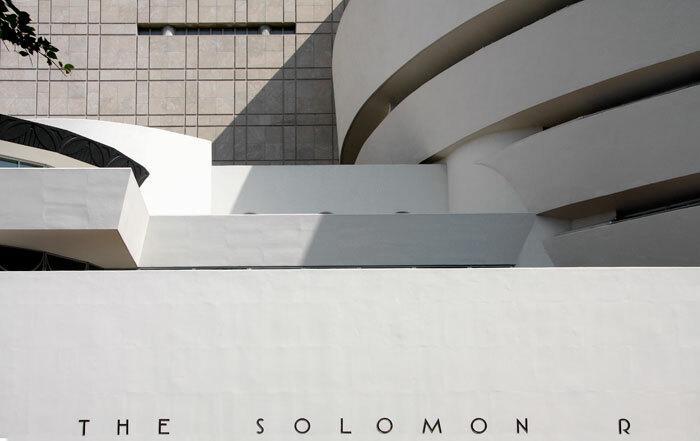 Solomon R Guggenheim began purchasing the modernist art of the twentieth century to display in his private apartment in the Plaza Hotel. There was public interest and admission to view as he continued to add to his collection. 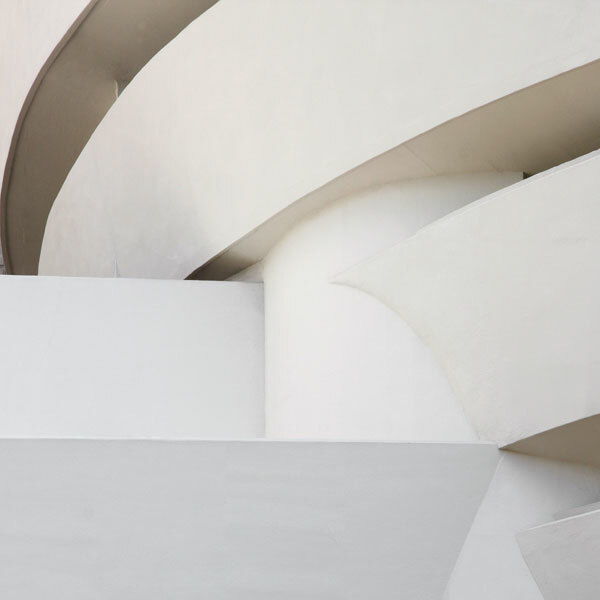 Working with his adviser, the artist Hilla Rebay, he established the Guggenheim Foundation in 1937 with an endowment and a remit to establish a public museum. In 1937 the Museum of Non-Objective Painting opened in rented space just south of Central Park at East 54th Street and Fifth Avenue, concentrating on contemporary artists. Non-Objective Painting has been defined as an art devoid of references to the natural world, its materials and its emotions, worked in a style characterised by geometric motifs composed on a shallow picture plane without linear perspective. 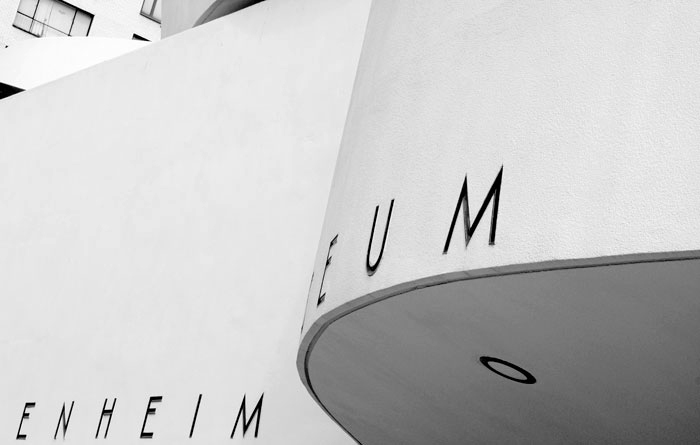 As the collection grew so did the need for a museum building designed especially to complement and display its works. 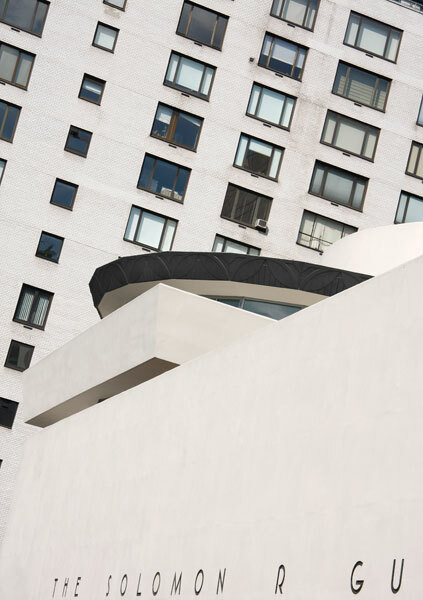 In 1943 Frank Lloyd Wright was engaged to prepare designs and Hilla Rebay located the site at 89th Street and Fifth Avenue where the Museum now stands. This is five blocks north of the Metropolitan Museum with its imposing 1902 Beaux-Arts façade by Richard Morris Hunt. 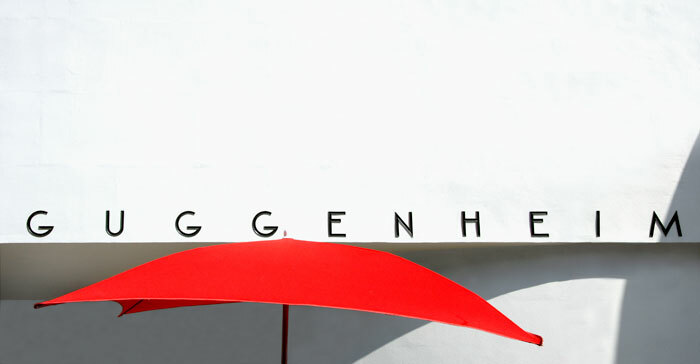 In the building’s fifteen-year gestation Wright completed some seven hundred drawings and six sets of plans. He died early in 1959 before the Museum opened to the public in October of that year. 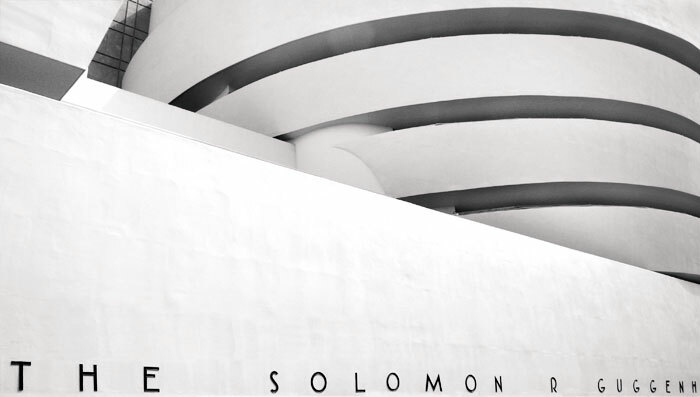 Solomon R. Guggenheim died in 1949. Wright’s final proposals were close to what stands today but changes in circumstances and finance prompted marked reductions in space as built. 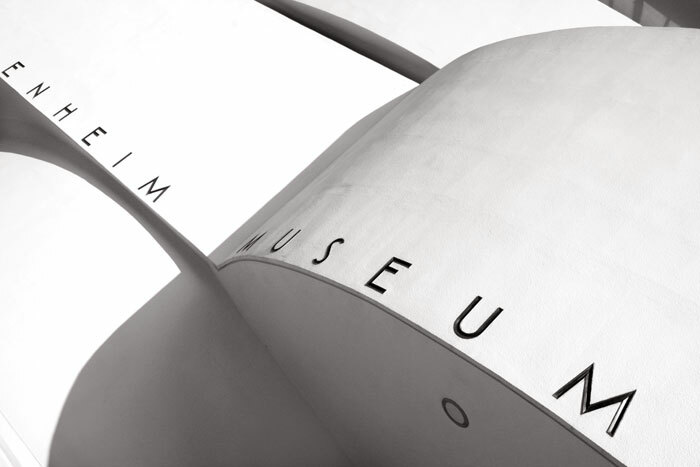 The original design’s concrete five-turn helical spiral form was intended solely as exhibition space, with framed works hung on the outer walls. From 1949-1952, Wright’s plans proposed an offset and rectangular ten-storey annex to house further galleries, offices, storage space, studio accommodation and a café but this remained a paper plan. Frank Lloyd Wright’s son-in-law, William Wesley Peters was closely involved in the design and acted as structural engineer. Originally apprenticed to Wright in 1932 he worked with him and devoted much of his life to promoting and preserving his mentor’s buildings. Peters’ own 1968 designs for an annex were incorporated into the 1990 reconstruction. In 1959 the Museum opened to mixed reviews. Natural light comes through the glazed skylight and a ribbon of clerestorey windows above the outer wall: a lighting system provides much of the exhibition illumination. The gentle slope of the continuous walkway and the curving wall backing the framed works apparently disturbed some visitors. The omission of the annex meant that administration, storage and other functions had to be accommodated within the rotunda and its attached northern extension. Inevitably this affected both the form and volume of exhibition space and the practicalities of operating the building. In 1990 the Museum was closed for two years to enable a major interior restoration of the existing building and the construction of an annex to a new design. 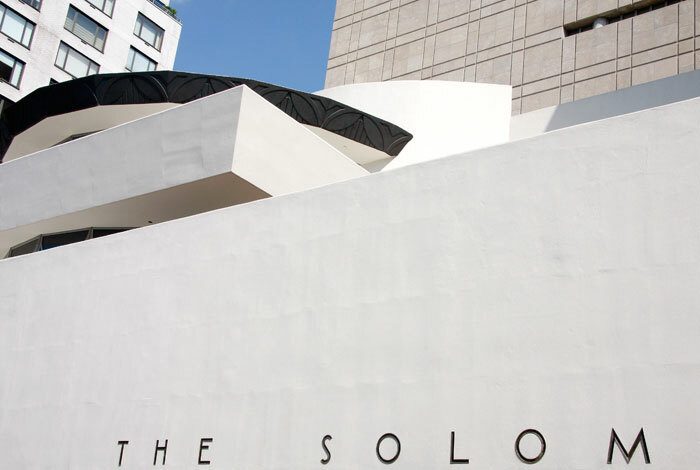 This was undertaken by New York architects Gwathmey Siegel & Associates. 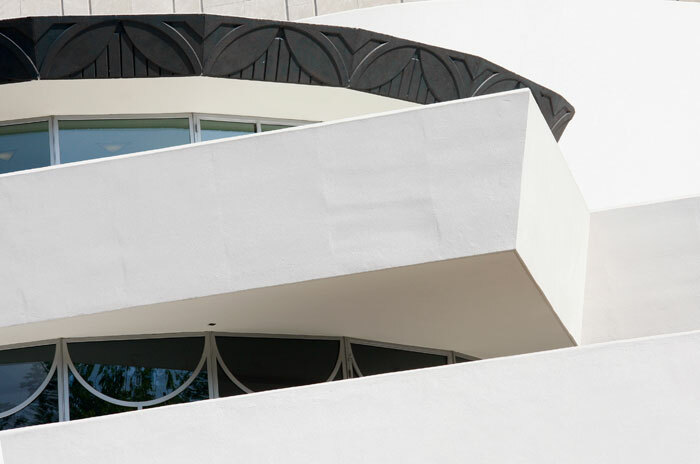 The restoration architects’ response acknowledged Frank Lloyd Wright’s original concept. An eight-storey rectangular tower was built behind the rotunda and northern extension to accommodate additional gallery space and replace the storage, administration and associated needs from the rotunda. A fawn limestone was used as cladding for the tower, with an incised grid design relieving the plain windowless facades. 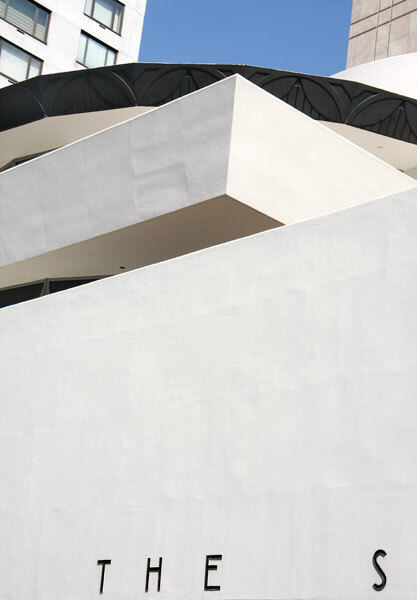 A linking structure integrates space and access to the three buildings and carries a new roof terrace at fifth floor level to display sculpture. Its extensive glazing opens up interior and exterior Museum views. 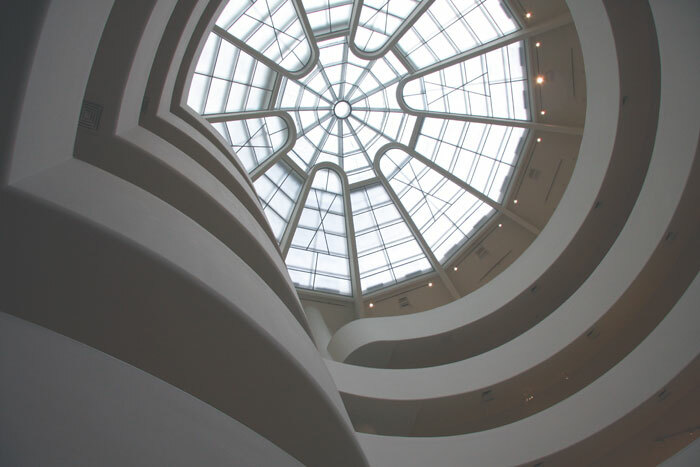 The interior was restored and the rotunda spiral was returned to Wright’s original intention as an exhibition space. The rotunda skylight was re-glazed and natural lighting was improved by the restoration of the clerestory glazing in the rotunda spirals and in the northern extension. The reworking provided some 4,700 square metres of new and restored gallery space, 130 square metres of office space, a revamped restaurant and improved storage. From 2005 to 2008 the original Museum buildings underwent an external restoration and repair following the removal of eleven earlier coats of paint. Shrouded in scaffolding, the Museum remained open to visitors throughout the work. 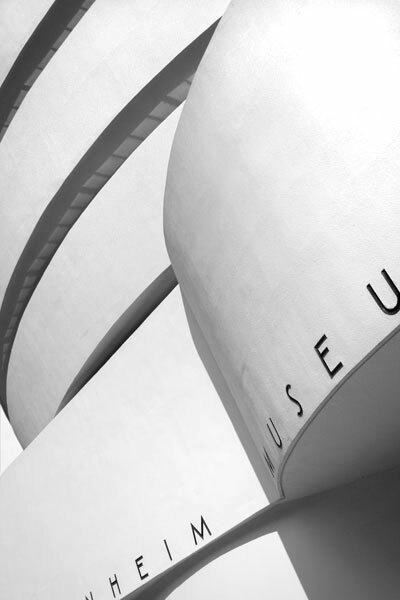 In writing these captions particular reference has been made to the historical and construction accounts published online by ArchDaily, Find Target, the Guggenheim Museum, and the architects Gwathmey, Siegal & Associates.